The Division of Water Quality Management (DWQM) oversees the Wastewater Operation Certification Program. 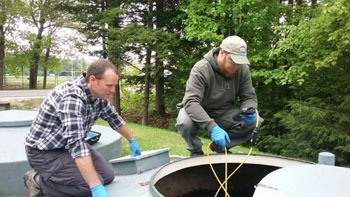 In partnership with DWQM, the New England Interstate Water Pollution Control Commission (NEIWPCC) handles day-to-day administration of the program through their South Portland Maine office which houses the Joint Environmental Training Coordinating Committee (JETCC) program. Operators of wastewater treatment plants that discharge to surface water or discharge by spray irrigation must be certified by the Department. Treatment plants are classified Grades I-V based on size and type of treatment. Types of operator licenses include Biological, Physical/Chemical (P/C), and Spray Irrigation Treatment System (SITS). Operators are certified through examination. The grade level and license type are based on the operator’s education and work experience. Maine uses a customized test developed in conjunction with the Association of Boards of Certification (ABC). To apply for an exam, Operators must complete an exam application and send with the appropriate fee to NEIWPCC-JETCC. Application forms can be found on the NEIWPCC-JETCC website. DEP reviews and approves all applications for eligibility to sit for an exam. Exams are offered by Computer Based Testing (CBT). CBT exams are administered through PSI/AMP at Assessment Centers in Portland, Farmington, Holden, Presque Isle, Portsmouth, NH, and PSI/AMP testing centers throughout the U.S. For more information on taking CBT exams, including a video explaining the exam process, visit the PSI/AMP website. A practice wastewater exam can be found at the ABC Website. Enter your name and click “Continue” to begin. Wastewater operator certificates are valid for two (2) years. Operators must renew their certification by March 1 every other year by showing evidence that they have completed eighteen (18) Training Contact Hours (TCHs) of approved training and paying a renewal fee. As an option, up to six (6) TCHs of Safety training may be applied toward the required 18 TCHs. Continuing education training must relate to the operation and maintenance of wastewater treatment plants or collection systems. All TCHs for certification renewal must be approved by DEP. It is the responsibility of the operator to ensure that TCHs are approved by DEP before attending a session. For training that is not pre-approved by DEP, information on the Proof of Training form and proof of attendance must be submitted to NEIWPCC-JETCC for DEP to review and approve the training. NEIWPCC-JETCC maintains a database on their website that allows operators to view their training records and verify Training Contact Hours (TCHs) that are on file. The database is updated monthly and may be viewed at the NEIWPCC-JETCC website. Odd-numbered certificates must be renewed by March 1 of odd-numbered years, and even-numbered certificates renewed by March 1 of even-numbered years. Renewal includes paying all fees and obtaining 18 TCHs of approved training. Certificates that are not renewed properly by the March 1 deadline become Inactive. Inactive operators cannot be the Operator of Record or Operator in Responsible Charge (ORC) of a treatment plant. If the operator fails to renew within 6 months of the deadline, including paying all fees and completing required training, they must retake the certification exam in order for their certificate to become Active. Inactive certificates that have not been renewed two years after the renewal deadline are revoked and the operator is no longer certified. Refer to the Department’s O&M News monthly newsletter for certification updates. For more information on certification, contact Judy Bruenjes at 207-287-7806, judy.k.bruenjes@maine.gov. To schedule an exam, download exam applications, or for questions concerning certificate renewals and Training Contact Hours (TCHs), contact NEIWPCC-JETTC, 207-253-8020, info@neiwpcc-jetcc.org. Title 32, Chapter 62, §§ 4171 - 4182. Chapter 531. Regulations for Waste Water Operator's Certification Program. For exam applications and other important certification documents, visit NEIWPCC-JETCC.